Manila (30 November) -- Secured through the intercession of the office of Rep. Maria Carmen Zamora-Apsay, the medical ambulance for the municipality of Compostela was released by the Philippine Charity Sweepstakes Office last November 23, 2010. In a simple ceremony at the PCSO office in Manila, the vehicle was officially turned-over to Mayor Jessie Bolo and SB Members Haidee Suarez-Jimenez, Teofilo S. Arcales, Nena G. Atamosa, Rogelio Econar, Juric G. Blanco, Paulino G. Musong and Franc Jed M. Intig. Rep. Zamora-Apsay and members of her congressional staff were also at hand as witnesses to the event. "We are happy to note that this ambulance was acquired and awarded by the PCSO without any counterpart fund from the local government unit," the lady solon said. "Our plea that its cost be fully shouldered by the charitable institution was favorably granted. This is very good news for Compostela as it will greatly enhance its capability to respond to medical emergencies within its jurisdiction and even its adjacent areas," she added. 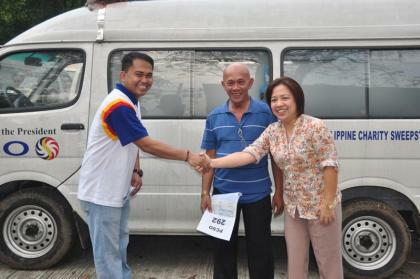 Mayor Bolo also expressed the municipality's appreciation to the donation. He said that it is both timely and beneficial owing to the fact that the ambulance currently being used by the town's health center, while still serviceable, is already old.